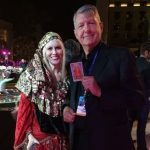 JOIN US AT THE MAD HEDGE LAKE TAHOE CONFERENCE. OCTOBER 25-26, 2019. Why Are the Markets Going Crazy? You would think that with US interest rates spiking up, as they have done for the past month, the US dollar would be strong. After all, interest rate differentials are the principal driver of foreign exchange rates. But you would be wrong. The greenback has in fact pared 12% off its value against the Euro (FXE) during this period. You also could be forgiven for thinking that weak economic growth, like the kind just confirmed by poor data in Q1, would deliver to us a rocketing bond market (TLT) and falling yields. But you would be wrong again. The harsh reality is that an entire range of financial markets have been trading the opposite of their fundamentals since April. Have markets lost their moorings? Do fundamentals no longer account for anything? Have the markets gone crazy? It?s a little more complicated than that, as much as we would like to blame Mr. Market for all our failings. Fundamentals are always the driver of assets prices over the long term. By this, I mean the earnings of companies, the GDP growth rates for the economies that back currencies, and the supply and demand for money in the bond market. Geopolitics can have an influence as well, but only to the extent that they affect fundamentals. Usually, their impact is only psychological and brief (ISIS, the Ukraine, Syria, Libya, and Afghanistan). However, and this is the big however, repositioning by big traders can overwhelm fundamentals and drive asset prices anywhere from seconds to months. You see this in the simultaneous unwind of enormous one-way bets, that for a time, looked like everyone?s free lunch and rich uncle. I?m talking about the historic longs accumulated in the bond markets over decades, not only in the US, but in Europe, Japan and emerging markets as well. 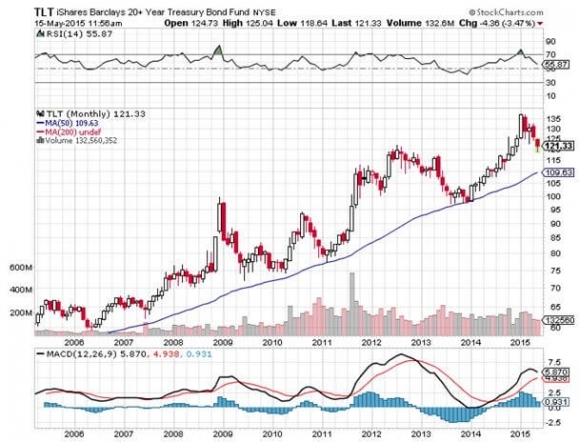 Treasury bonds have been going up for so long, some three decades, that the vast majority of bond portfolio managers and traders have never seen them go down. A frighteningly vast number of investment strategies are based on the assumption that prices never fall for more than a few months at a time. This is a problem, because bond prices can fall for more than a few months at a time, as they did like a lead balloon during the high inflation days from 1974 to 1982. I traded Eurobonds during this time, and the free lunch then was to be short US Treasuries up the wazoo, especially low coupon paper. That trade will return someday, although not necessarily now. What is making the price action even more dramatic this time around is the structural decline in market liquidity, which I out lined in glorious detail in my letter last week (The Liquidity Crisis Coming to a Market Near You). 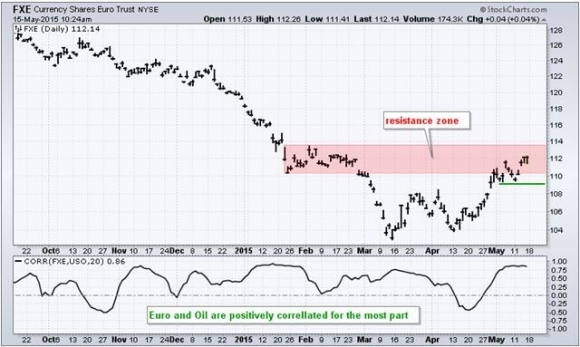 You are seeing exactly the same type of repositioning moves occurring right now in the Euro/dollar trade. 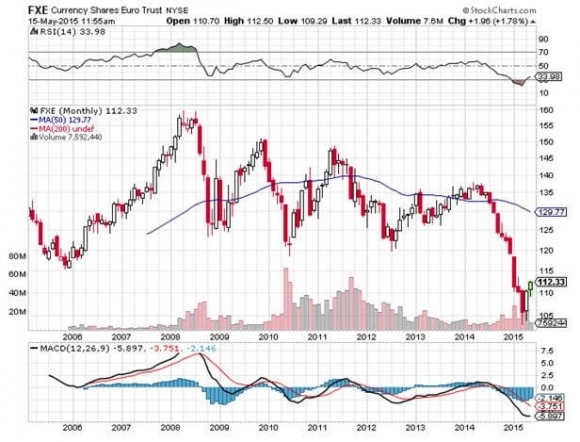 I have been playing the Euro from the side for the past seven years, when it briefly touched $1.60. All you had to do was spend time on the continent, and it was grotesquely obvious that the currency was wildly overvalued relative to the state of its horrendously weak currency. Unfortunately, it took the European Central Bank nearly a decade to get the memo that the only way out of their economic problems was to collapse the value of the Euro with an aggressive program of quantitative easing. This they figured out only last summer. By then, the Euro had already fallen to $1.40. After that, it quickly becomes a one-way bet, as every junior trader started unloading Euros with both hands. The result was to compress five years worth of depreciation into seven months. Extreme moves in asset prices are always followed by long periods of digestion, or boring narrow range trading. This is what you are getting now with the Euro. This is why I covered all my Euro shorts in April and went long, much to the satisfaction of my readers (click here for the Trade Alert). I have since taken profits on those longs, and am now short again (click here for that Trade Alert). I think it could take six months of consolidation, or more, until we take another run at parity for the greenback. The rally in the continental currency is taking place not because the economic fundamentals have improved, although they have modestly done so. It has transpired because traders are taking profits on aged short positions, or stopping out of new positions at a loss because they were put on too late. The Euro will remain strong only until this repositioning finishes, and the short term money is either flat on the Euro, or is long. It will only be then that the fundamentals kick in, and we resume the downside once again. As I used to tell me staff at my hedge fund, if this were easy, everyone would be doing it, and it would pay peanuts. 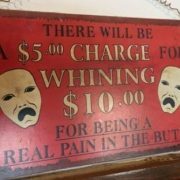 So quit complaining and get used to it. 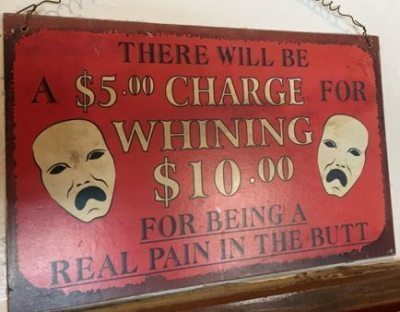 https://www.madhedgefundtrader.com/wp-content/uploads/2015/05/Whining-Plaque-e1431720013716.jpg 312 400 Mad Hedge Fund Trader https://www.madhedgefundtrader.com/wp-content/uploads/2019/02/mhft_2ab1cd7cc5e7a19b697311f13459e0fa.png Mad Hedge Fund Trader2015-05-18 01:04:112015-05-18 01:04:11Why Are the Markets Going Crazy? There is a very high degree of risk involved in trading. Past results are not indicative of future returns. 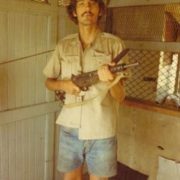 MadHedgeFundTrader.com and all individuals affiliated with this site assume no responsibilities for your trading and investment results. The indicators, strategies, columns, articles and all other features are for educational purposes only and should not be construed as investment advice. Information for futures trading observations are obtained from sources believed to be reliable, but we do not warrant its completeness or accuracy, or warrant any results from the use of the information. Your use of the trading observations is entirely at your own risk and it is your sole responsibility to evaluate the accuracy, completeness and usefulness of the information. You must assess the risk of any trade with your broker and make your own independent decisions regarding any securities mentioned herein. 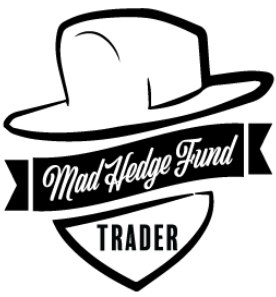 Affiliates of MadHedgeFundTrader.com may have a position or effect transactions in the securities described herein (or options thereon) and/or otherwise employ trading strategies that may be consistent or inconsistent with the provided strategies. Copyright © 2019. Mad Hedge Fund Trader. All Rights Reserved.